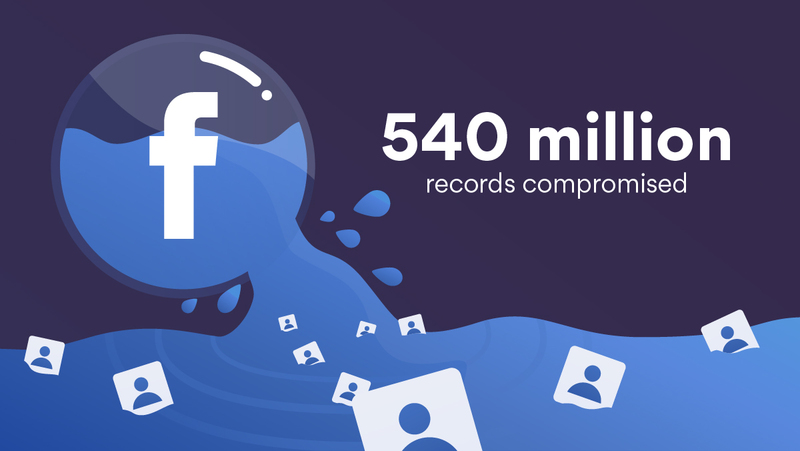 Over 540 million Facebook user data records were compromised after third-party apps and sites stored the data on unsecured servers. The huge breach comes after numerous promises by Facebook to boost security, and it may prove to be one of the most dangerous yet. Find out why. Two third-party Facebook app developers – Mexico-based Cultura Colectiva and an app called At The Pool – stored a total of about 540 million Facebook user data entries on unsecured Amazon Web Services (AWS) servers. The data stored by Cultura Colectiva included more than 540 million “comments, likes, reactions, account names, FB IDs and more” from Facebook users. This data may seem innocuous, but a hacker or scammer could use it to defraud thousands of users. Far less data was stored by At The Pool, but their data may have been more dangerous. In addition to their names, email addresses, and other Facebook data, the data included 22,000 plaintext passwords. The researchers assume that these passwords were used for the app, not Facebook. However, anyone using the same password for their other accounts would be at high risk. At The Pool’s website has apparently been defunct since 2014. It is therefore likely that the data has been left unsecured at least since then. It took almost 3 months for Cultura Colectiva to secure its users’ data. At The Pool’s data was secured much more quickly, but this may have simply been a stroke of good fortune. Their data set was taken offline during UpGuard’s investigation and before they sent any notification emails. However, the data had already been left unsecured for about 5 years. If you haven’t been using At The Pool or Cultura Colectiva apps, this breach probably didn’t affect you. However, it has shown how little control Facebook has over how your data is used. Do you know what type of data Facebook and its third-party apps collect about you? Are you sure that every Facebook app you use is storing your private data securely? You may not know until it’s too late. Unfortunately, you have little to no control over how your data is used and stored once you give it away. The trick is to reduce your data footprint. For more cybersecurity alerts and tips, subscribe to our monthly blog newsletter below!